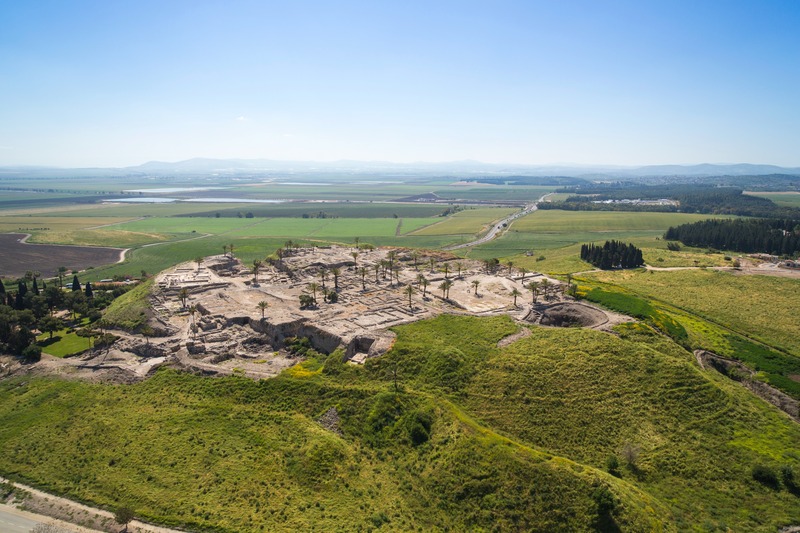 During Chanukah, while I was home, several members of my family and I took a little drive down to Tel Megiddo, in the Jezreel Valley area not far from Haifa. 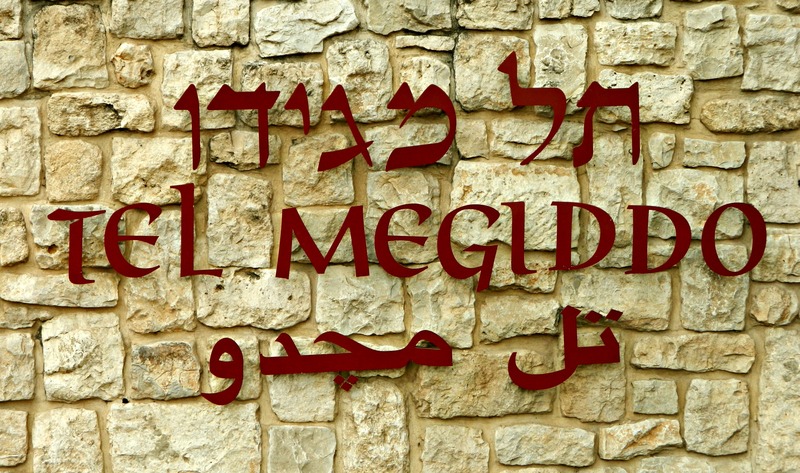 Herein lies the story of our adventure to the ancient city conquered and reconquered over twenty times, a city whose Greek name is Armageddon (a corruption of Har Megiddo, or Mount Megiddo). 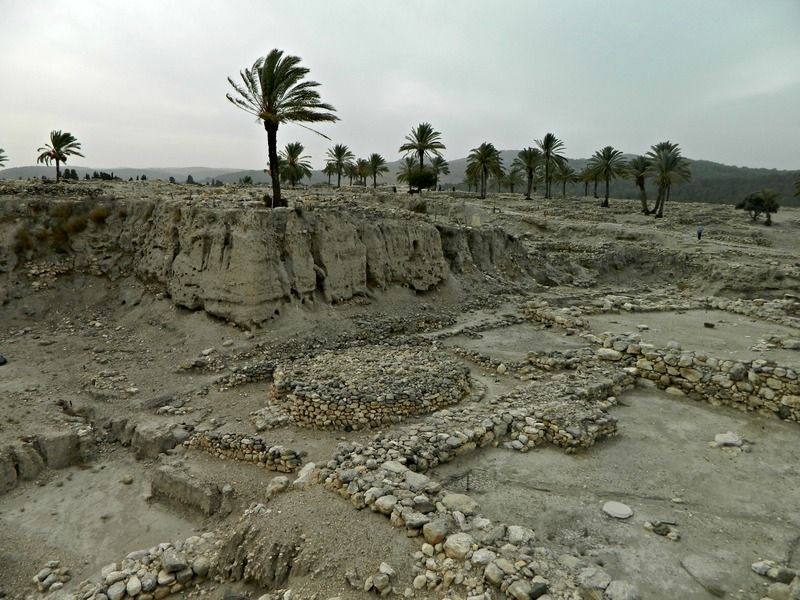 Later, in the 1960’s, further excavations were conducted by famed Israeli archaeologist Yigael Yadin for the Hebrew University. 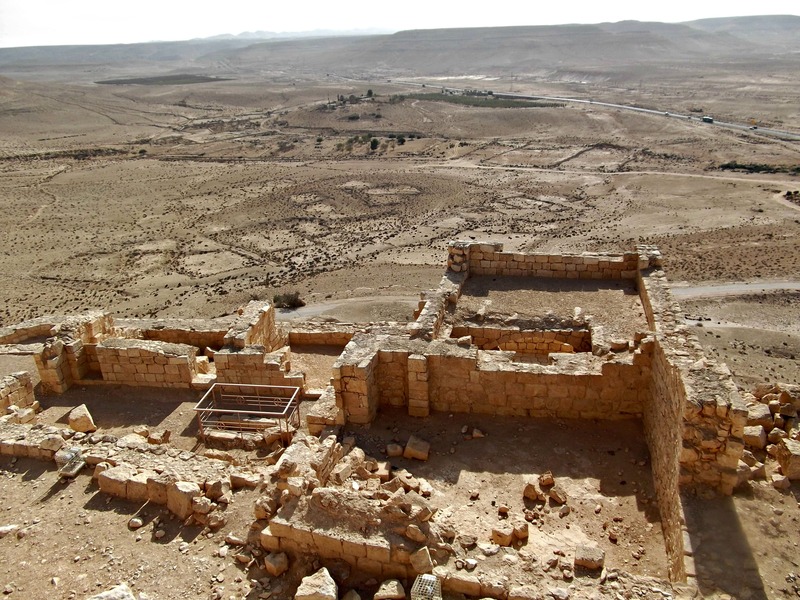 Unearthing twenty-six layers of ruins, from the Jews to the Egyptians to the Romans, the same small area was built and rebuilt time and time again over thousands of years. 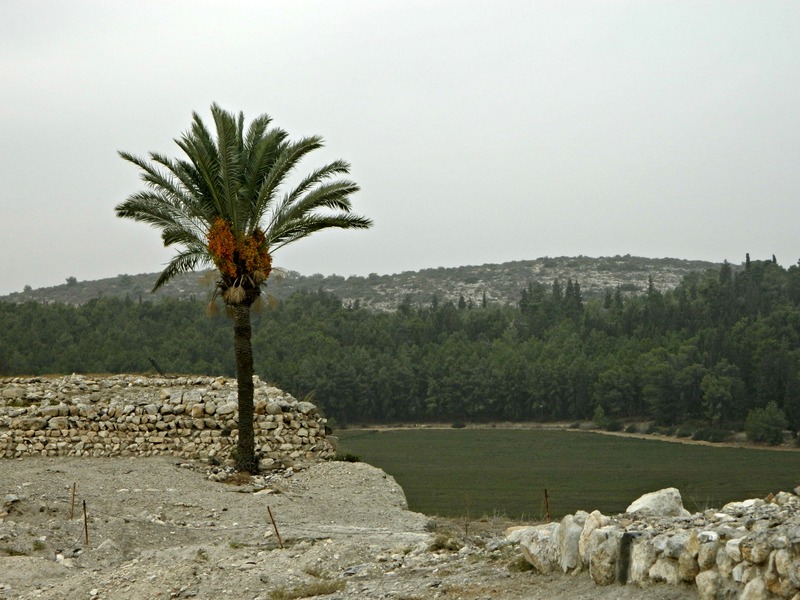 Some of the very interesting historical battles that took place in and around Megiddo include: the Egyptians under Pharaoh Thutmose III vs. the Canaanites of Megiddo and Kadesh (1478 BCE), the Egyptians under Pharaoh Necho II vs. the Kingdom of Judah under King Yoshiyahu (609 BCE) and more recently, the Allied Forces under General Allenby vs. the Ottoman Empire (1918). 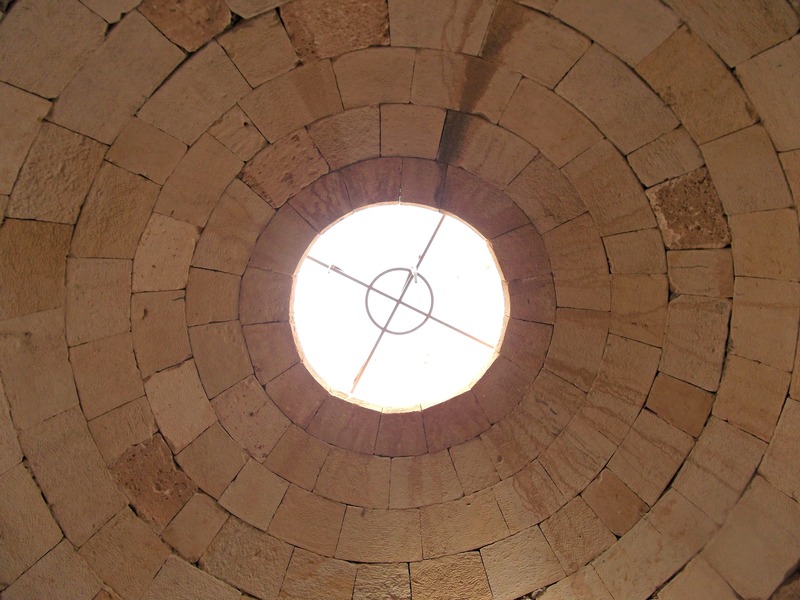 At the very western edge, where the trail seems to lead to nowhere, is the water system – an “L”-shaped shaft cut out of the bedrock to supply the city with water in time of siege. 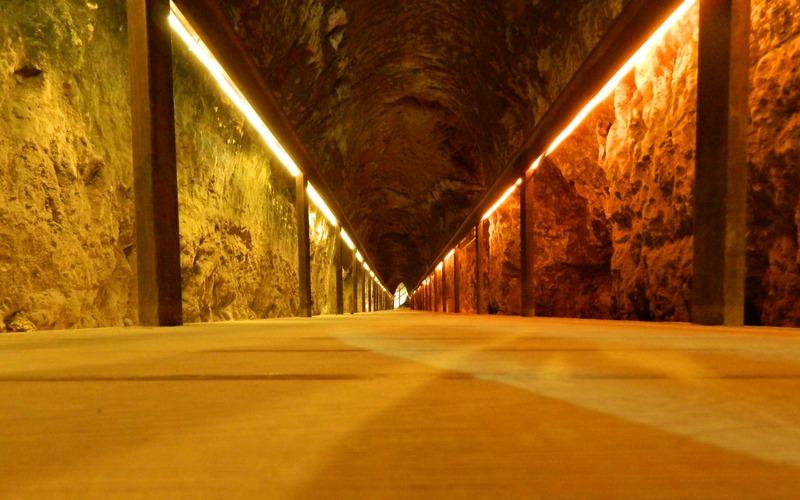 Built during the time of the Israelite kings, the 36-metre (120-foot) deep vertical shaft and the 70-metre (230-foot) long horizontal shaft hooked up to a freshwater spring emerged in a natural cave. 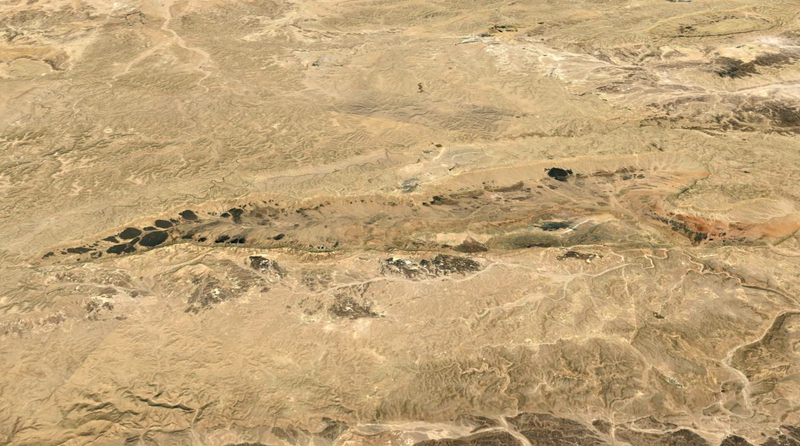 They then blocked the cave’s other entrance, the one visible to those outside the city, and camouflaged it. At the top of the staircase coming up from the dank spring, we took the long path back to the park entrance – along the extremely black asphalt road – and returned to our car. From the park we attempted to visit the Juara Museum but when we got there we discovered it was inside an army base and required reservation – maybe I’ll get to visit it one day on my army explorations. 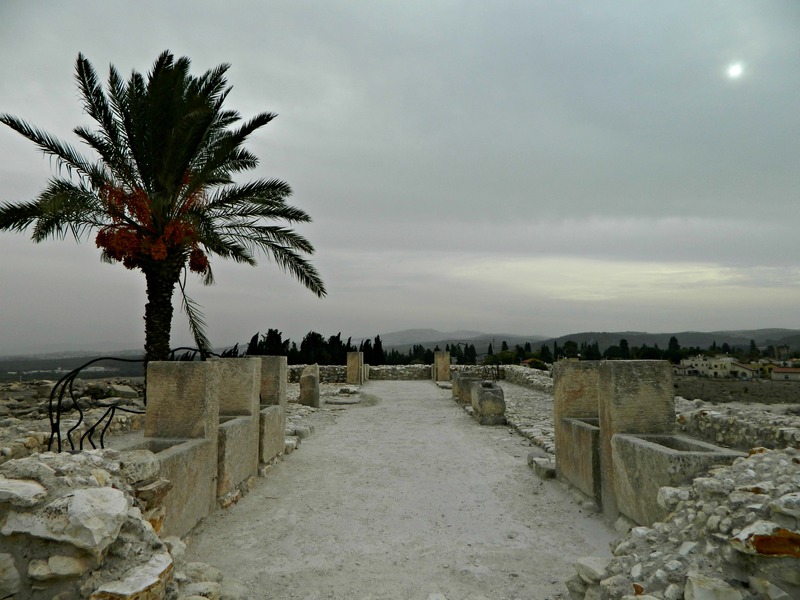 After the failed museum visit we headed into Yokneam and got dinner at a popular hummus restaurant, Hummus Eliyahu – highly recommended. Then we went home and lit the chanukiyah. 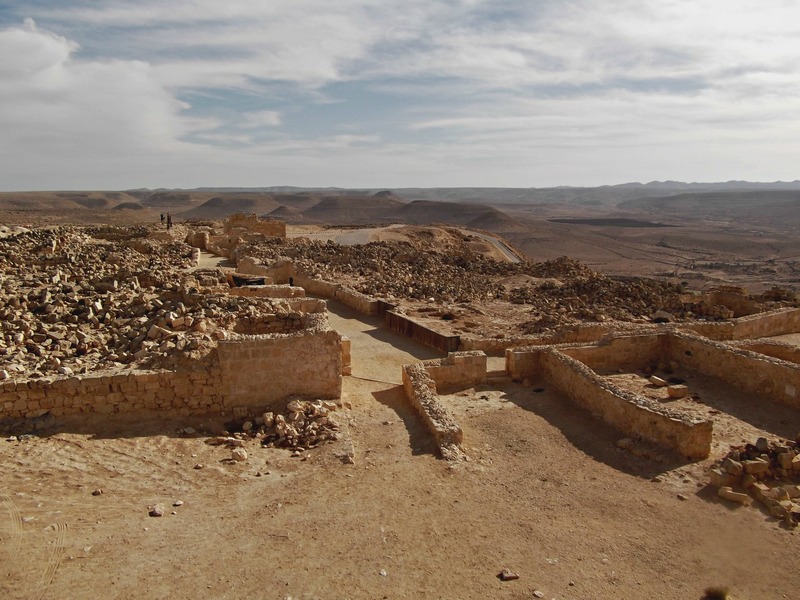 Returning to the desert trilogy of blog posts… After visiting Sde Boker, Midreshet Ben Gurion and the ancient ruins of Avdat I pushed southwards and stopped at Mitzpe Ramon. 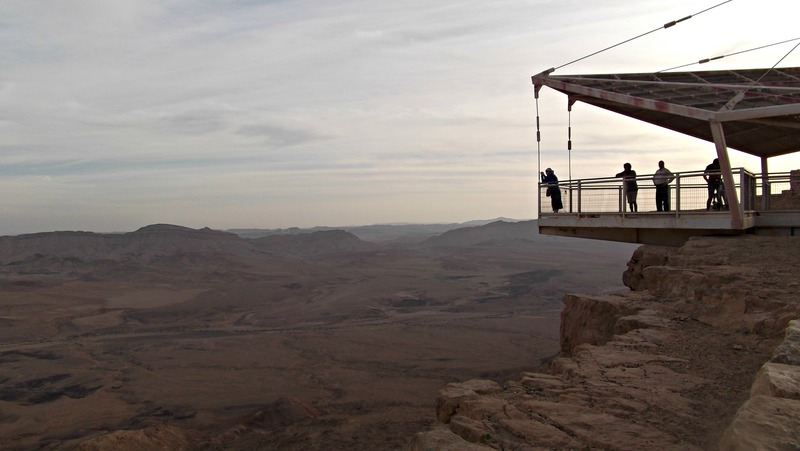 A town on the northern ledge of Ramon Crater, Mitzpe Ramon is where the Parks Authority office is, as well as other sites of interest. Not left with many options, the sun gradually sinking over the horizon, I called it a day and made up my mind to try to come back. 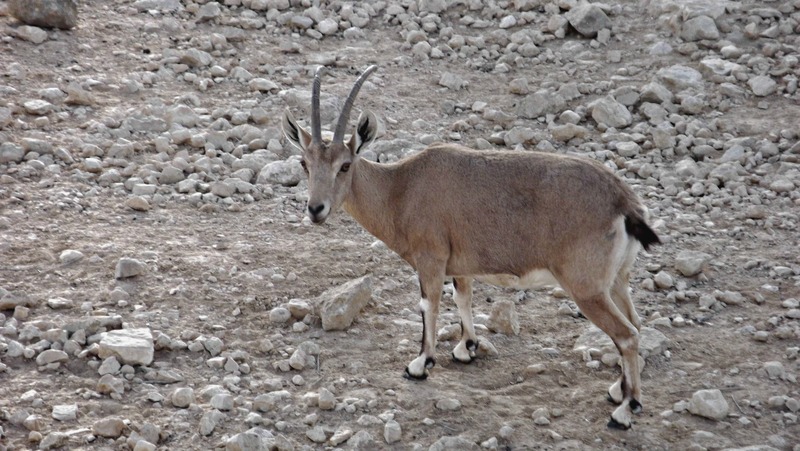 Two days later, after a nice night in the desert where I had a near run-in with a dangerous little yellow scorpion, I found myself with plenty of free time and so popped on a bus to Mitzpe Ramon. 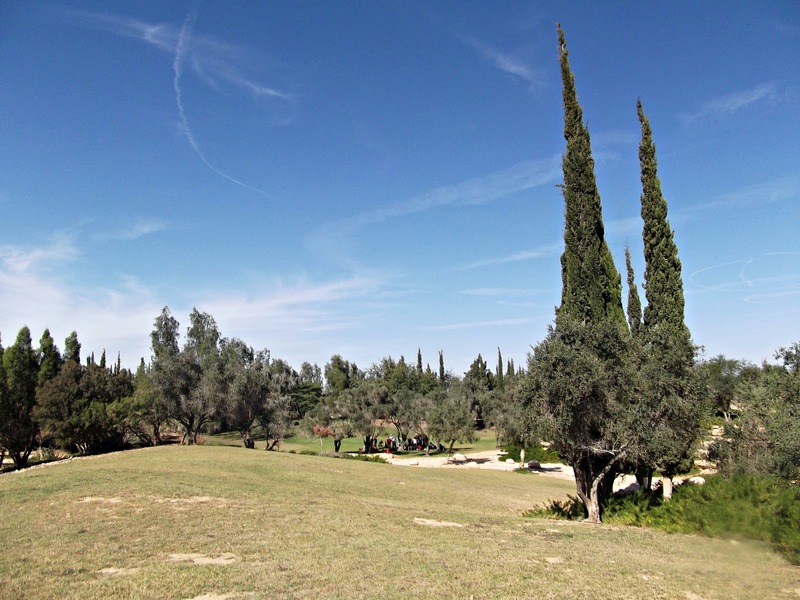 After a partially-guided tour of Bio Ramon I had lunch and then eventually, as the hour of my Visitors Centre appointment approached, I made my way to the edge of the crater. 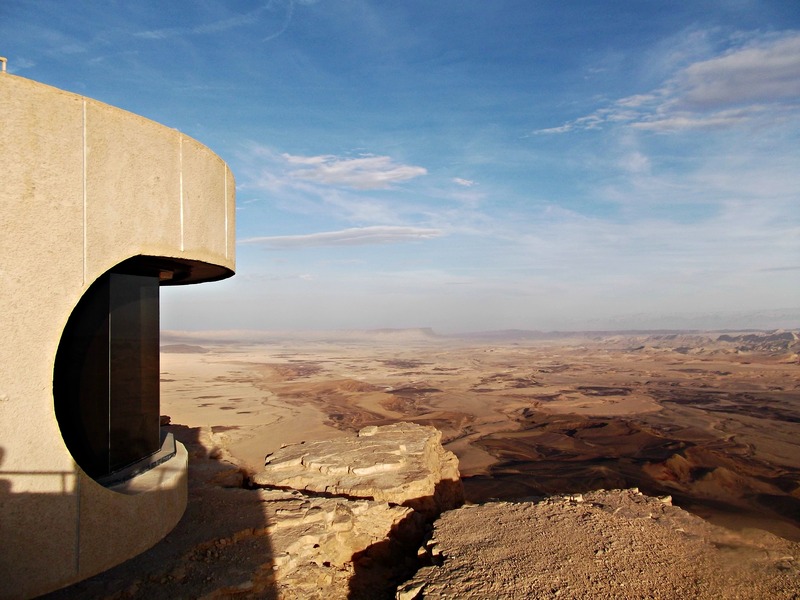 The Ramon Crater is a whopping 38 kilometres long, 4-10 kilometres wide – the largest of Israel’s erosion craters. 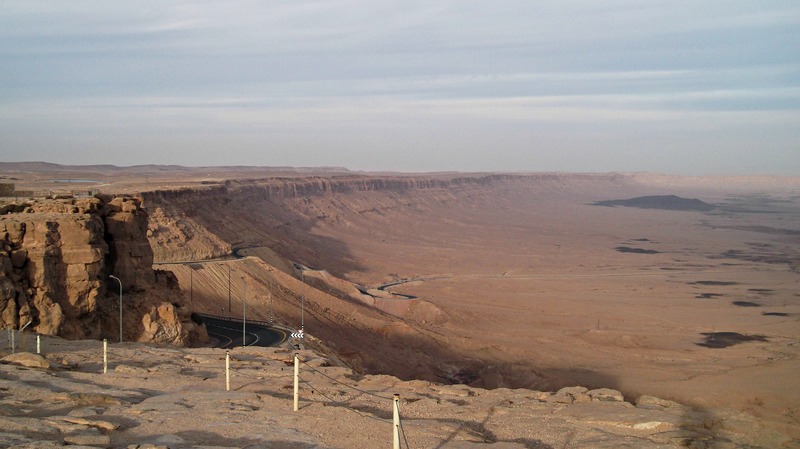 Along with the Small Crater and Large Crater to the north and two mini-craters at Mount Arif, the Ramon Crater joins two Egyptian craters in the Sinai Peninsula as being the only erosion craters on Earth. At last I was admitted into the Visitors Centre and the tour began with Israeli hero Ilan Ramon, a colonel in the Israeli Air Force and Israel’s first astronaut. 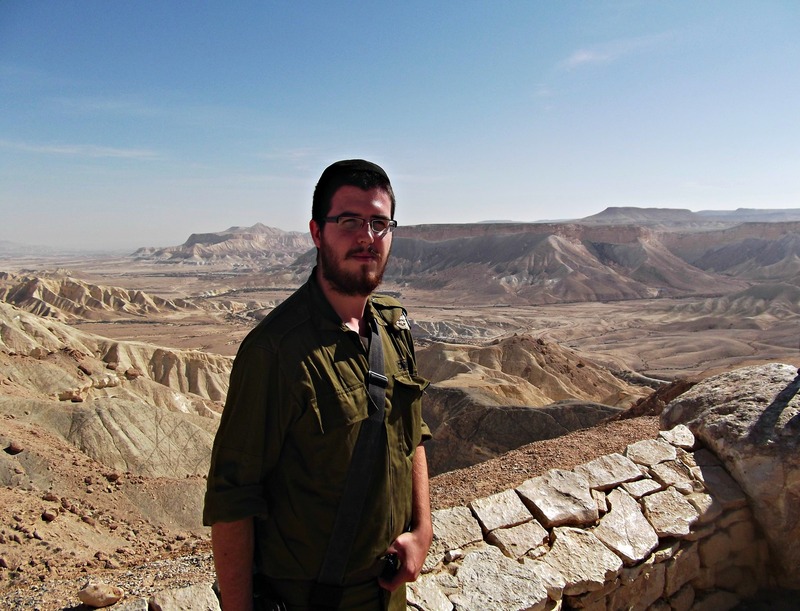 I remember reading in the papers shortly after I moved to Israel about the death of Ilan’s son, Asaf Ramon, who was killed in a plane crash – himself an IAF pilot as well. 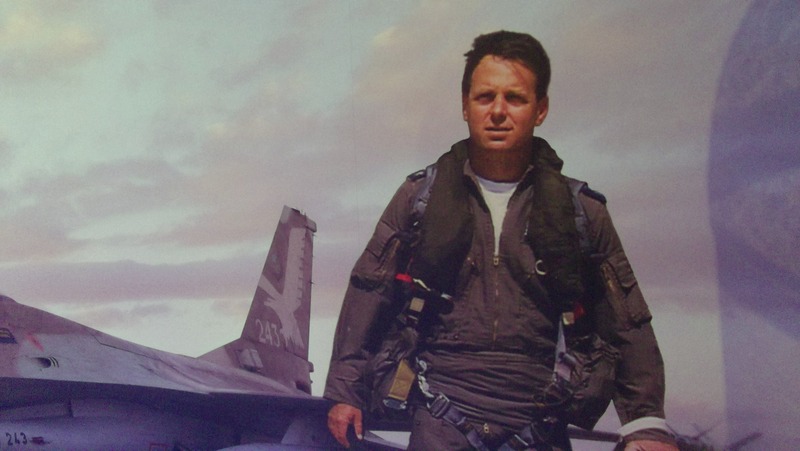 Ilan Ramon was a crew member of NASA’s Columbia space shuttle and was killed tragically, to the world’s horror, as the shuttle disintegrated upon re-entry into Earth’s atmosphere on February 1, 2003 just sixteen minutes before their scheduled landing. 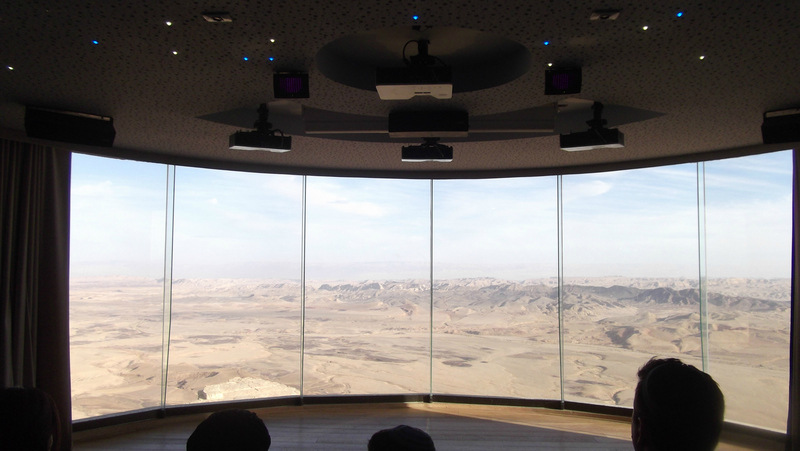 I never thought much about the story, nor the man involved, but I must say, the Visitors Centre did a great job at opening a window into the life of Ilan Ramon. 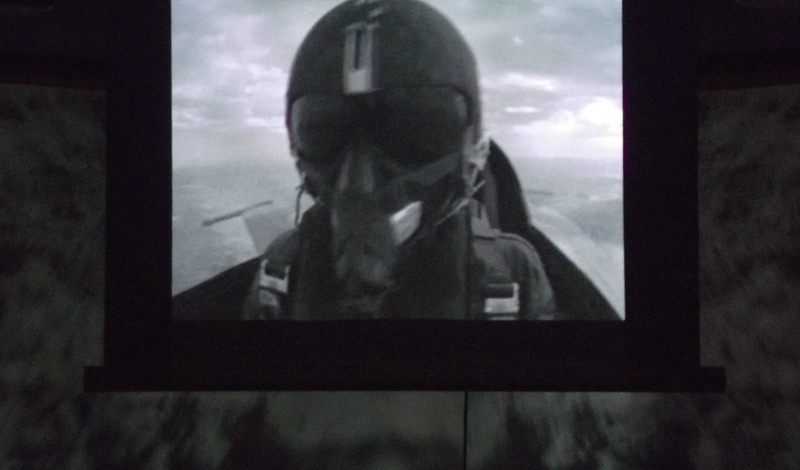 But before Ilan became an astronaut, he was a fighter pilot in the IAF and was the youngest of the eight pilots to take part in Operation Opera – the daring bombing of Iraq’s unfinished Osiraq nuclear reactor in 1981. 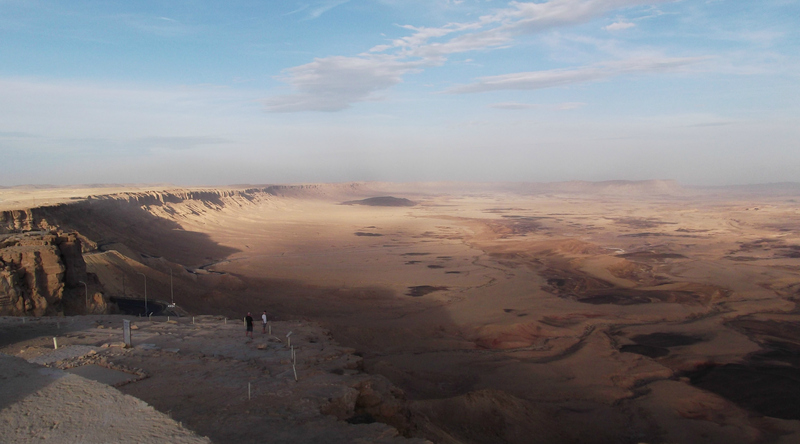 After an exhibition on the creation of the erosion crater, including hands-on activities and a great flexible rubber model of the crater area, we headed on up to the roof for an even better view of the Ramon Crater. 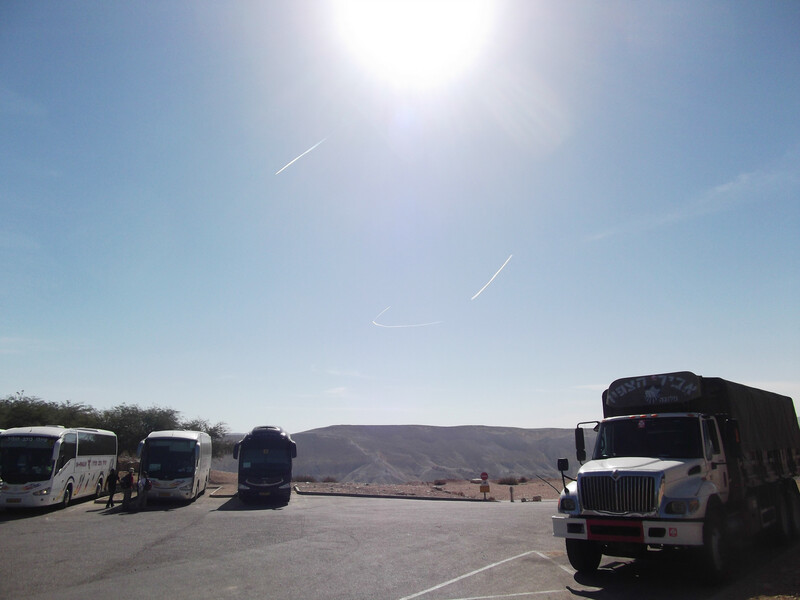 And so ended my adventurous week in the desert. 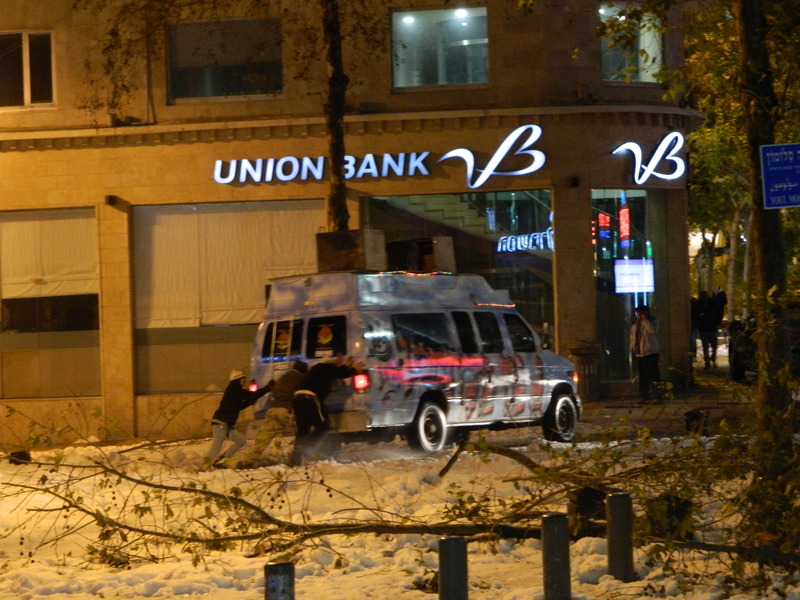 This blog post interrupts the three-part “desert adventure” (of which only Ben Gurion: Life and Death and Avdat have already been published, to date) to focus on an event which threw some of the country into shock and the media into a frenzy – the huge snowstorm that hit Jerusalem. 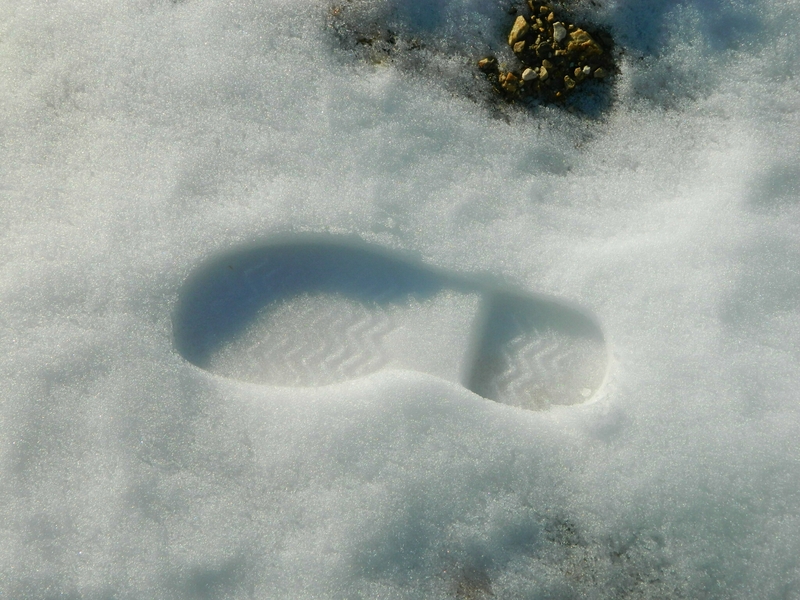 We in Ma’alot got a little dabbling of snow over the weekend, but nothing like the two feet of snow the capital got. The snowstorm got so intense that the city was effectively shut down and isolated, the army (Homefront Command in particular) brought in and four people even died. 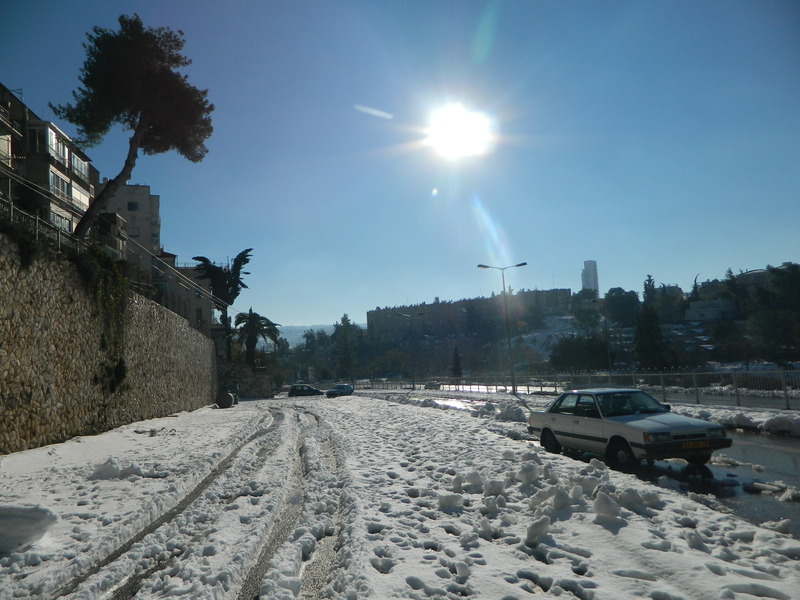 Thousands if not more spent Shabbat without power and so, in the wake of the storm I did go, visiting “Jerusalem of White” to see it for myself. 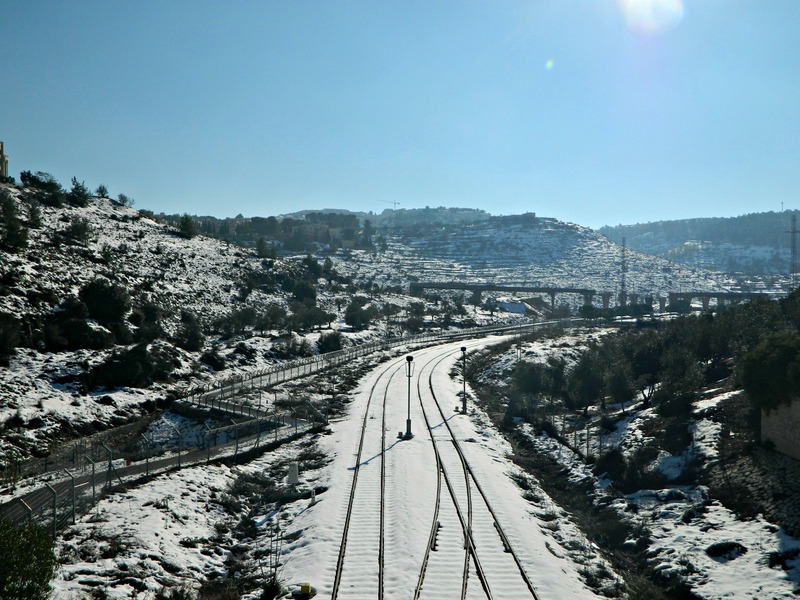 Part of a huge storm that hit the Middle East, the Golan and Upper Galilee region were hit with even more snow (those living in Tzfat had similar troubles to those in Jerusalem) but I was already headed down south on military business. 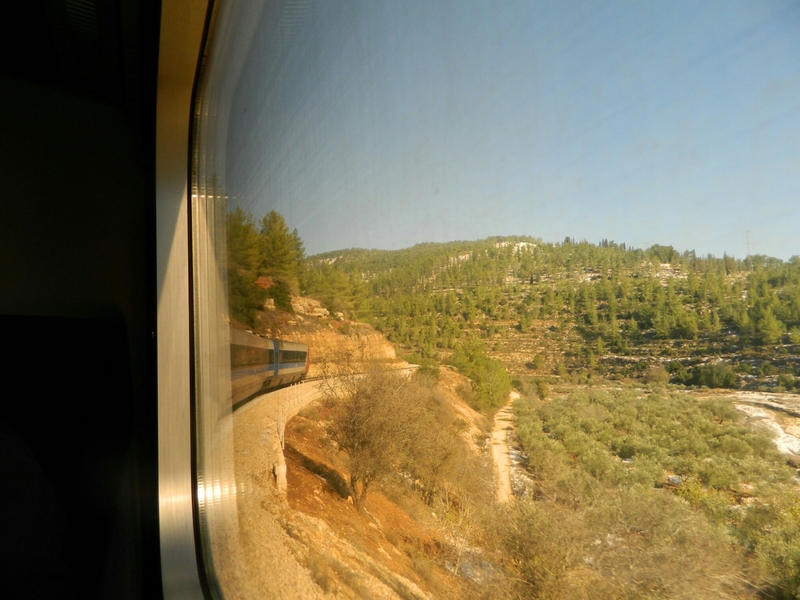 I took the train from Tel Aviv to Jerusalem, hoping that the mountainous route would be spectacular but to my surprise there was almost no snow until we reached the Jerusalem Malcha station. Waiting around to see whether or not the buses were running, I was asked by an American fellow for bus help. Then an Oriental tourist. Then an Israeli family. Pretty soon I was surrounded by a clamoring mass of cold, stranded people all looking to me for salvation. I had to explain that I was not in capacity as “helpers” like those soldiers wearing reflective orange vests from Homefront Command, and that I had no idea about the buses. 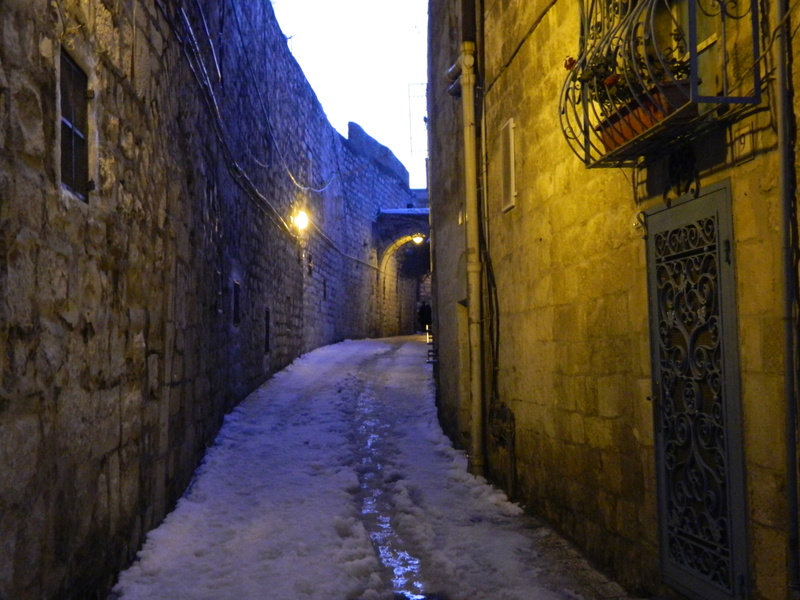 I then hightailed out of the area, taking the road to the Old City on foot. I noticed as I walked that the farther I penetrated the city, the deeper the snow got. I stopped along the side to mark my territory with a footprint – gotta love the feeling of untouched snow crunching underfoot. I entered into the residential areas, not seeing anything familiar save the big green signs pointing me in the direction of the Old City. At one point, slipping in the snow sliced apart by slushy tire tracks, I turned around and took some pictures. 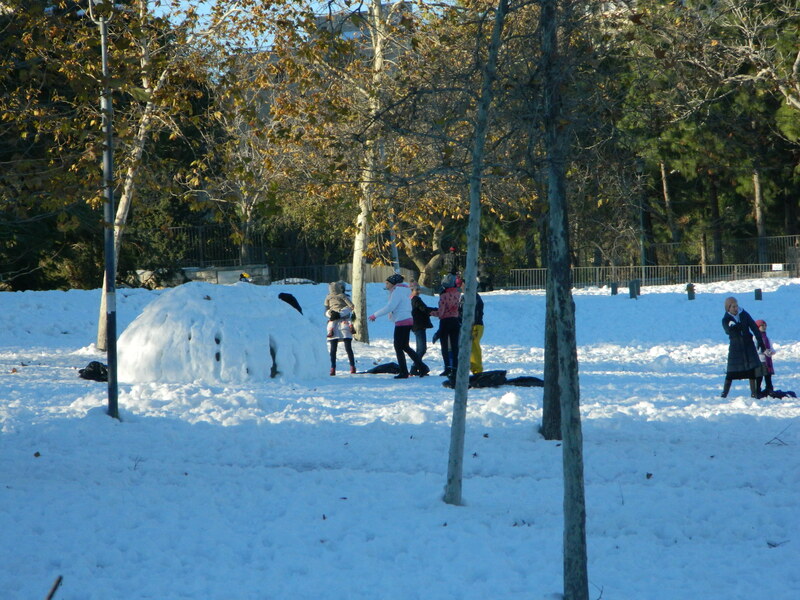 As I walked I passed by people playing in the snow. Whether children lobbing hunks of snow at one another, or rebellious youth carefully sculpting a snowman, the snow brought smiles to so many faces. I got stopped by a US Consul guard who informed me that I wasn’t allowed to take pictures of their vehicles, their guard booths or their building. I explained to the cautious man that I was an American so it should be fine. 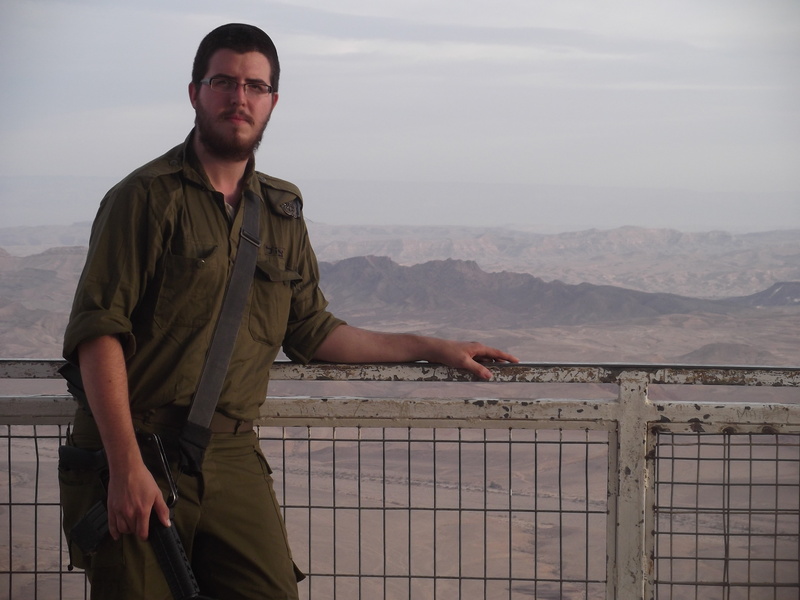 We had a laugh and I found out he was stationed in the sister-base of mine down south, although in Givati (Infantry) Special Forces. 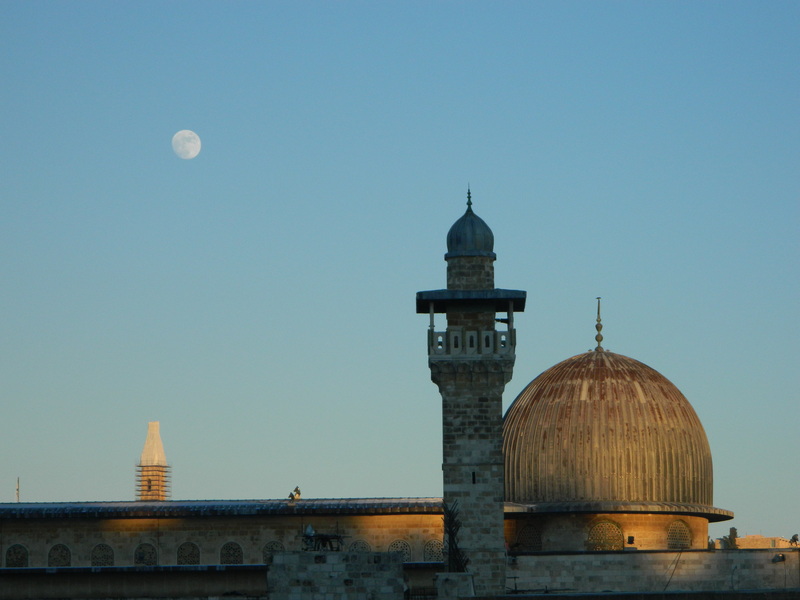 With that I smiled, wished him a joyous guard shift and continued down the road to the Old City. 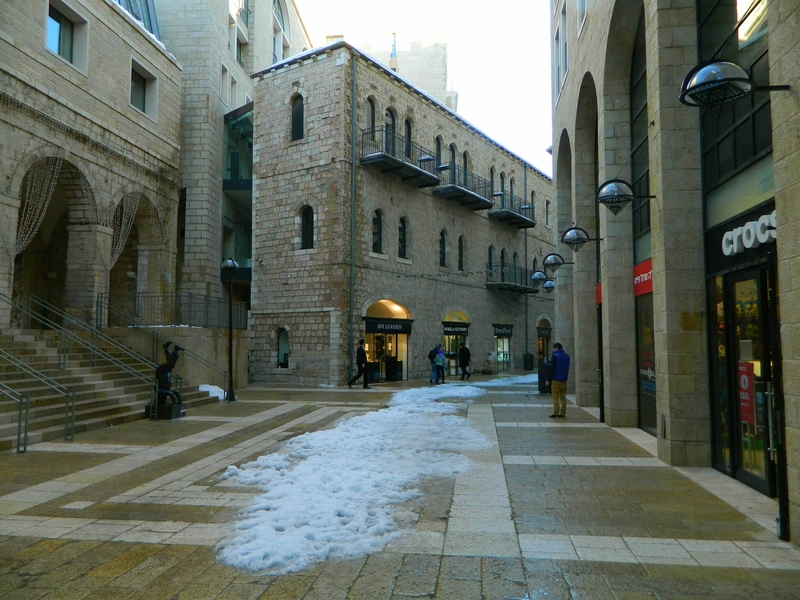 Before long, I entered Mamilla Mall – from there it already feels like the Old City. At last, after over seven kilometres (approx. 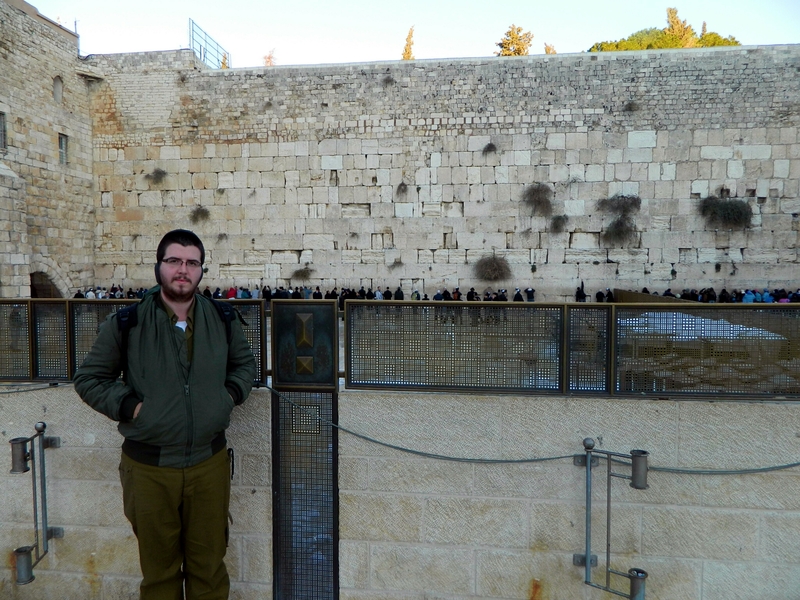 four miles) of somewhat laborious walking, I reached the Kotel. There I relaxed, prayed and had some European guy take my picture. I was hoping to be able to see some snow in the photo but the local workers washed it all away with huge hoses (leading to another problem: ice). 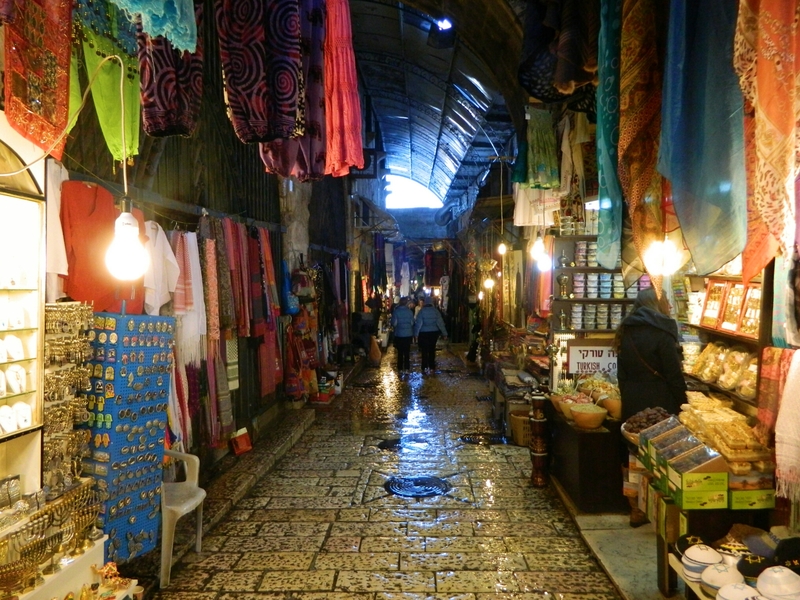 I stopped for a bite to eat as the sun went down and then continued on through the Jewish Quarter, walking down the narrow corridors to the Jaffa Gate (I still don’t really know my way around the Old City and that usually results in me blindly following people as they turn corners here and there all willy-nilly). 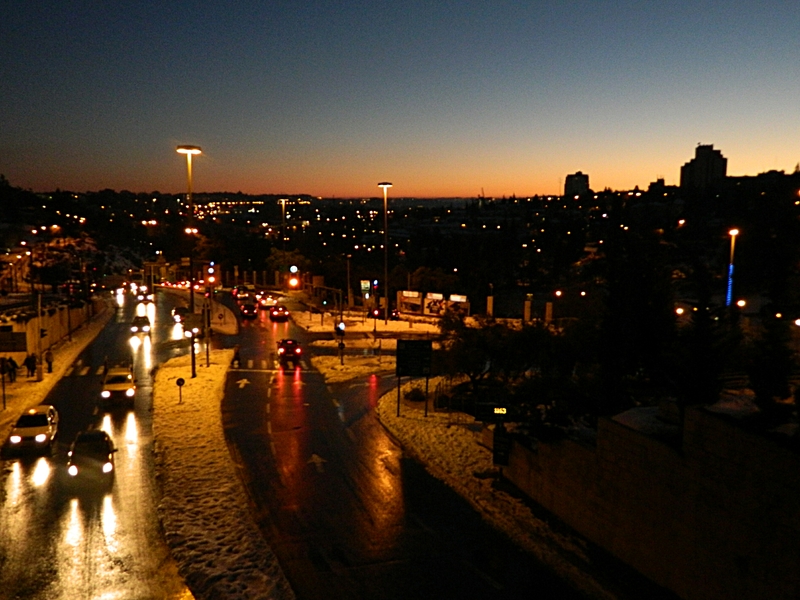 Once I’d exited the Jaffa Gate I seized the opportunity to photograph the last moments of light standing over the traffic on the bridge that connects Mamilla to the Old City. 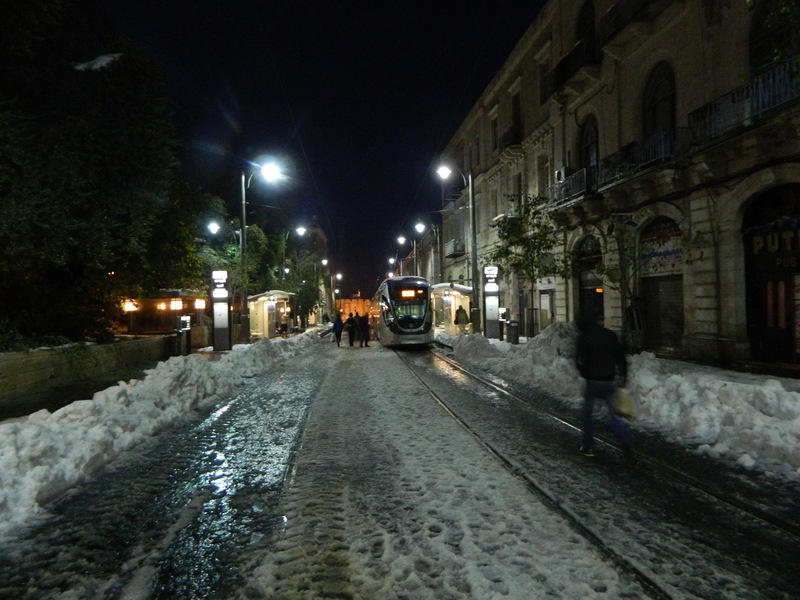 I then turned northwest and headed up Jaffa street, following the tracks of the light rail – closed down due to the weather. It was a cool feeling strolling with all walks of life down the partially cleared street; there was a quiet in the air and little clouds kept coming out from each and every face. 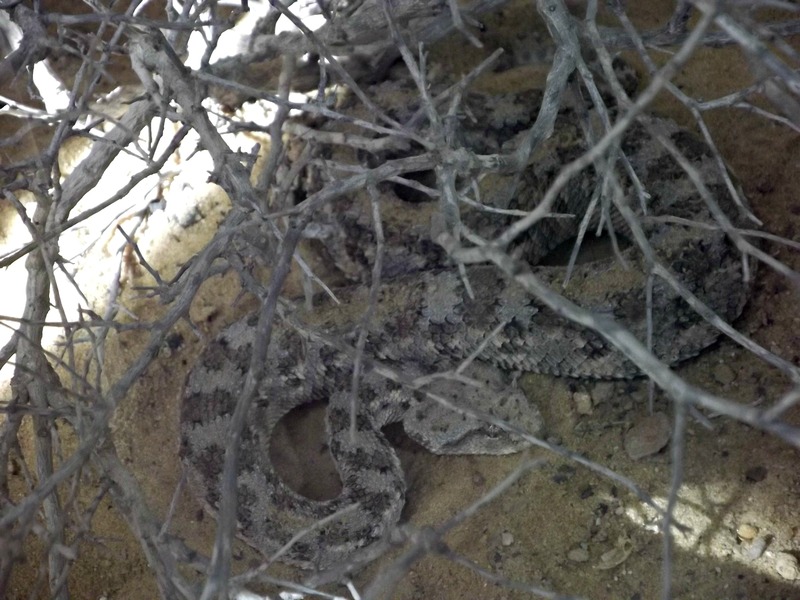 At one spot I noticed a commotion going on at the side. 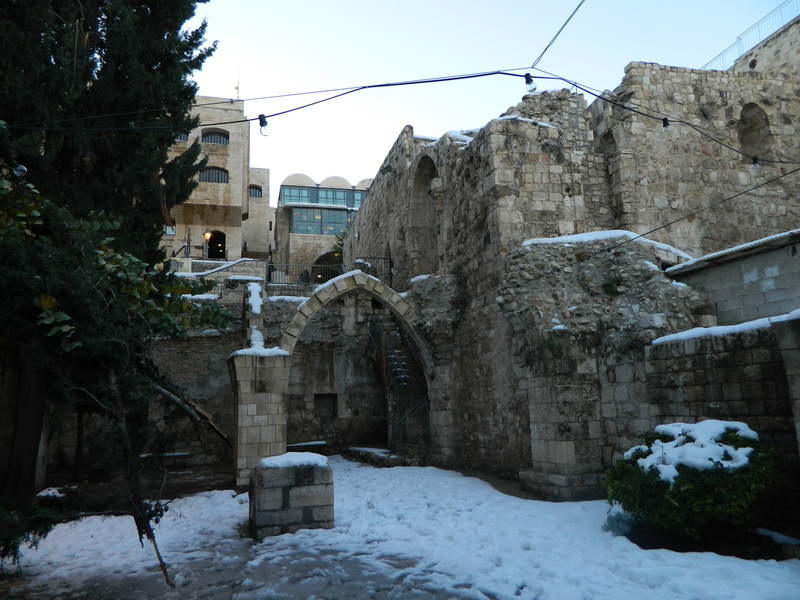 A Breslov “Na Nach” van had gotten stuck in the snow (or something) and they had to push it free – if only they would have worked to music, like they always play. After walking some four kilometres (2.5 miles) from the Kotel to the Central Bus Station, I reached the third floor where the 480 bus to Tel Aviv departs from, to hear an announcement that due to the weather and police advice all intercity buses have been canceled. That left me with just the train, which is in the far southwest corner of the city. 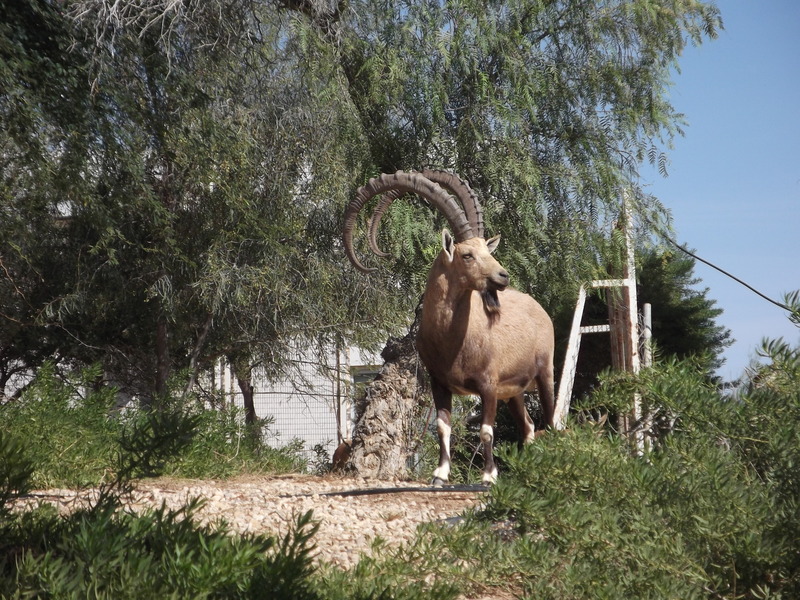 With no energy to walk that, especially after already walking eleven kilometres (seven miles) that day in Jerusalem alone, I kinda lingered around waiting for a local bus that headed that way. Cold and tired I waited… and waited. At last I found a bus that eventually reached near the train station. I hopped aboard, found a seat and had an interesting conversation with some local youth. An hour later I was in the train station and 8.5 hours after my return trip began I was home. What a trip! 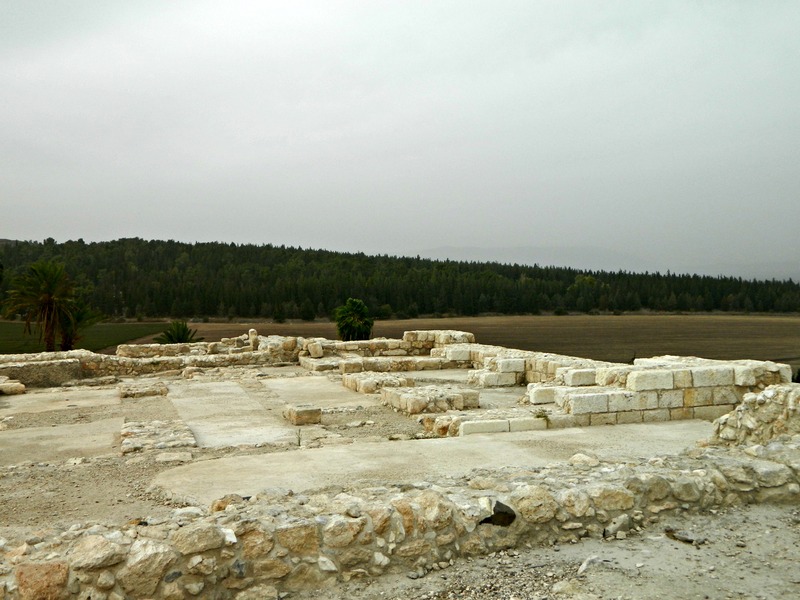 After visiting Sde Boker and Midreshet Ben Gurion, the home and burial place of Israel’s first Prime Minister David Ben Gurion, I drove a few kilometres south to Avdat, a national park preserving an ancient mountain-top city. 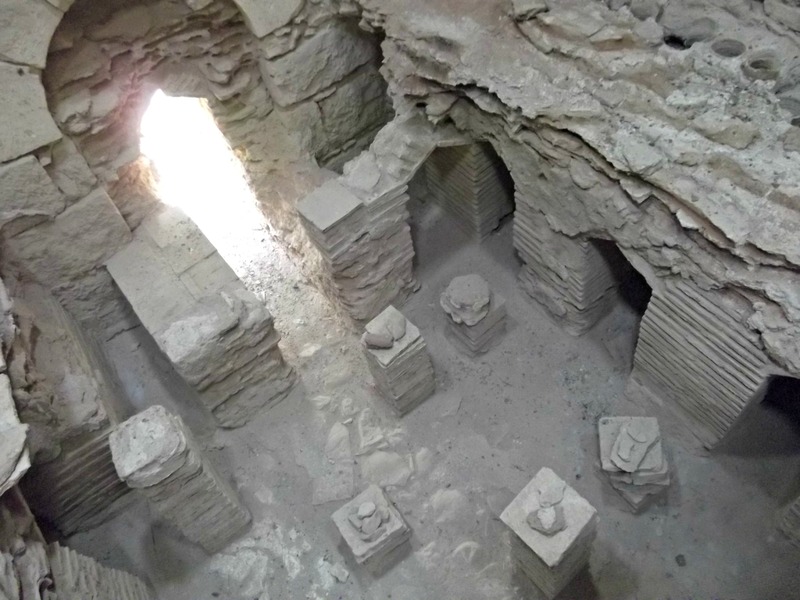 I had once passed this extraordinary ruins, seeing it from the road, and now I had the time and opportunity to explore it. 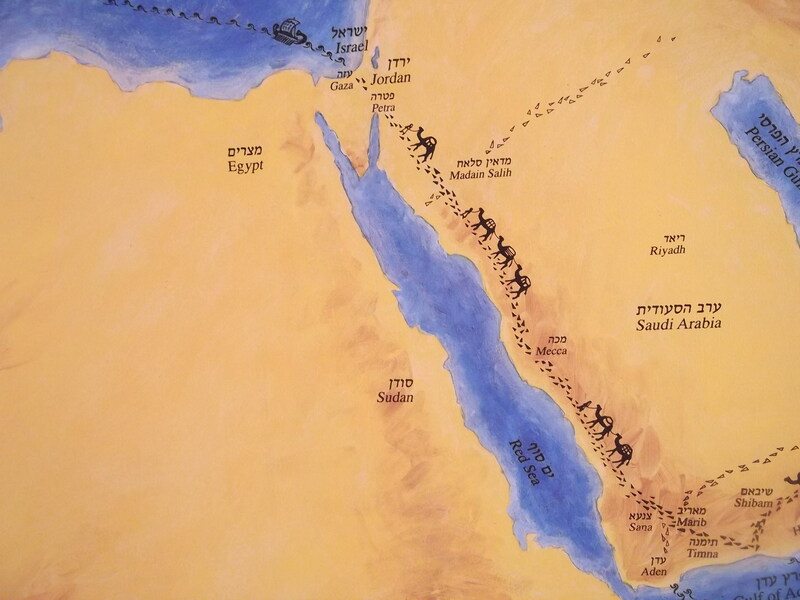 Using my handy “year park pass” I gained entrance and watched an interesting video about the site and about the Incense Route, an ancient trade route extending from the southern Arabian Peninsula (Yemen and Oman on our maps) and ending in Gaza, a port city on the Mediterranean Sea. 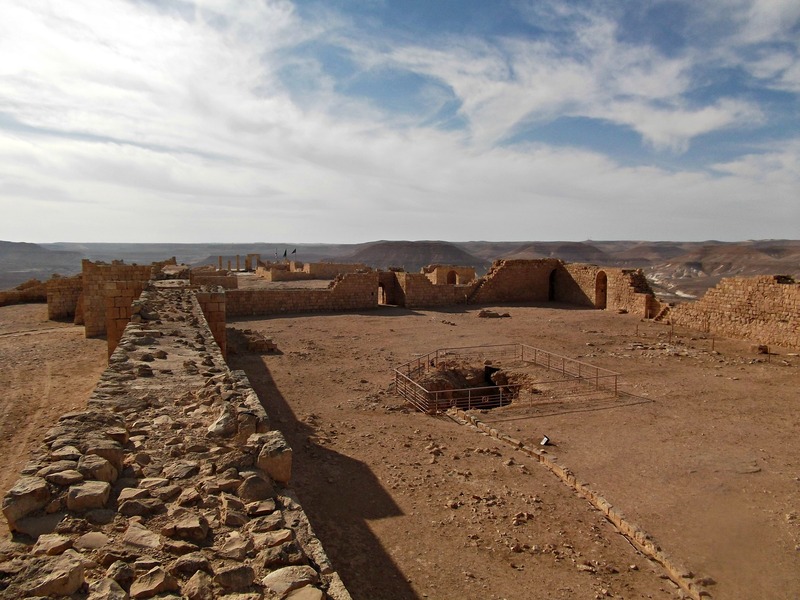 The Nabateans, a nomadic people which expanded into a powerful kingdom, ruled the area of the Incense Route some 2,200 years ago. 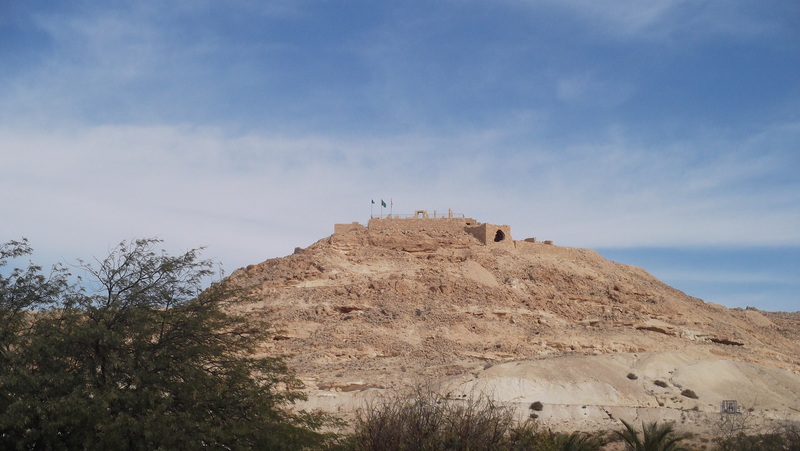 As they became more and more organised they built fortresses and waystations for the convoys making the journey from the Arabian Peninsula to the Mediterranean Sea. 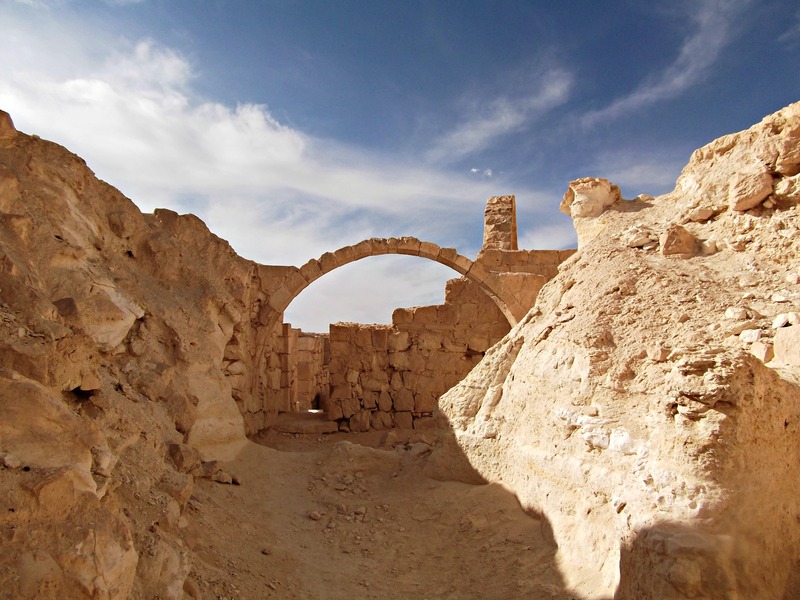 After Petra, the famous tourist destination in Jordan (also the filming location of key parts in Indiana Jones and the Last Crusade), Avdat was one of the most important stop along the Incense Route – station #62. 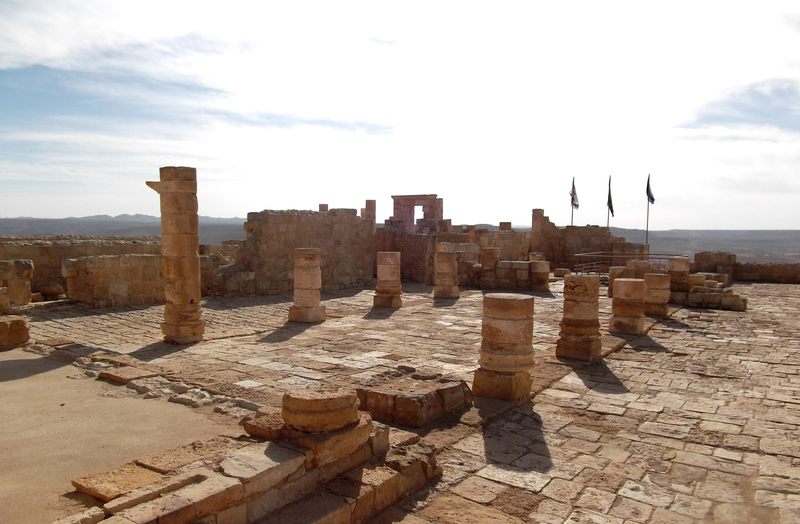 As such, the city was further expanded and built up by the Romans and Byzantines after the Nabateans were annexed by the Roman Empire, polytheism turning to Christianity. 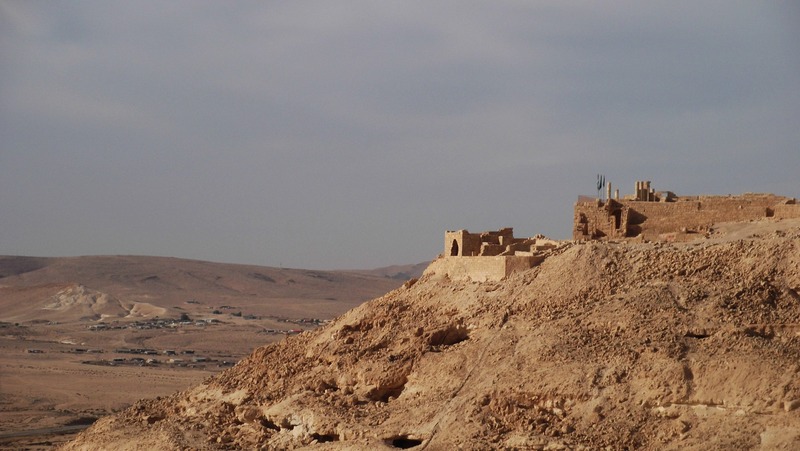 Next I trekked up the mountain to the base of the ancient Nabatean city, which was believed to have been called Ovdat or Obodat named after the Nabatean king Obodas II. Half-way up I came across the first tier of ruins, a Byzantine house likely belonging to a middle-class citizen, perhaps a wine merchant. 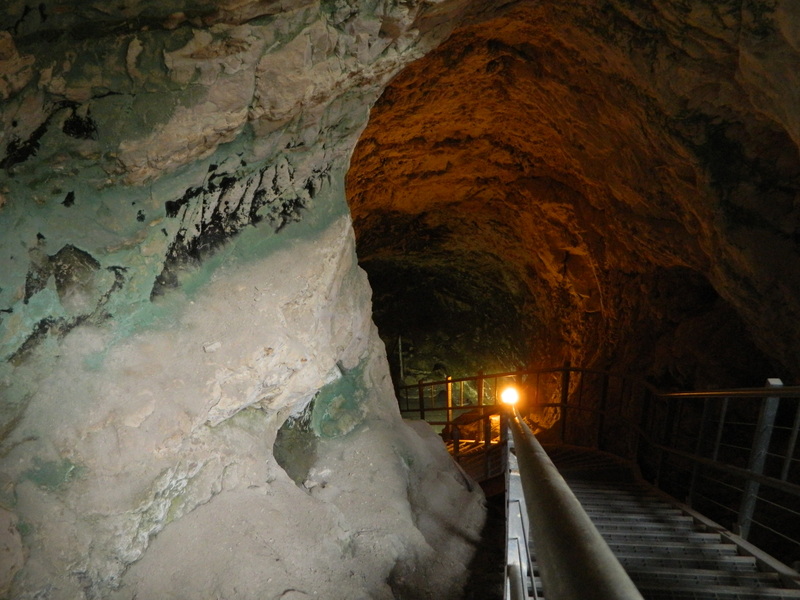 After leaving the cave I walked the rest of the way down the mountain and headed back for my truck. 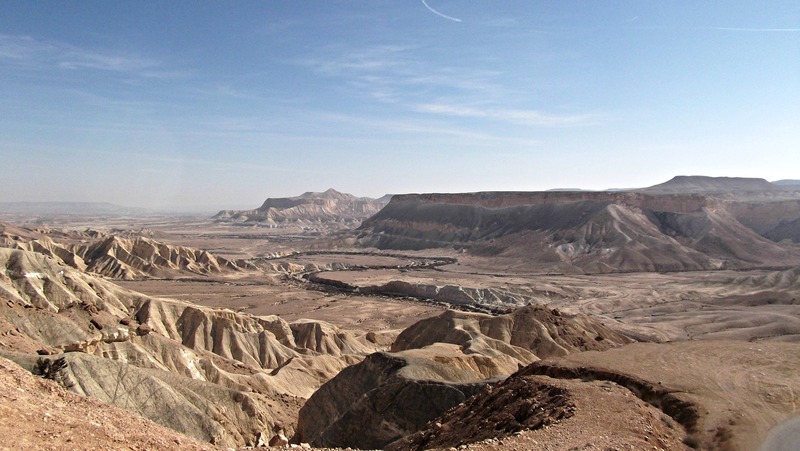 Next stop, Mitzpe Ramon! Last week I spent a few days in the desert down south, driving my army truck around and going on adventures in my spare time. One day I was fortunate enough to have many, many hours of spare time and visited numerous interesting sites, among them two national parks. 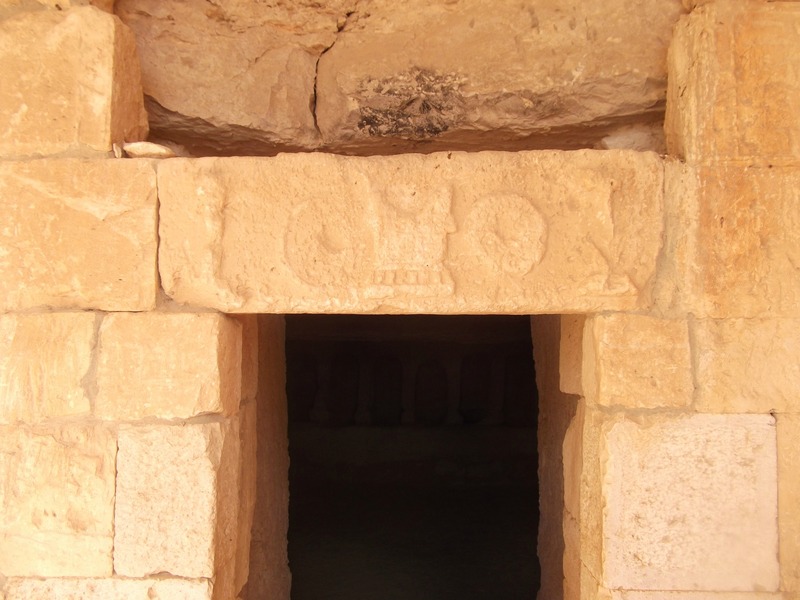 The first stop was Sde Boker, the little Negev kibbutz where David Ben Gurion – Israel’s first Prime Minister – staked his claim and settled down. 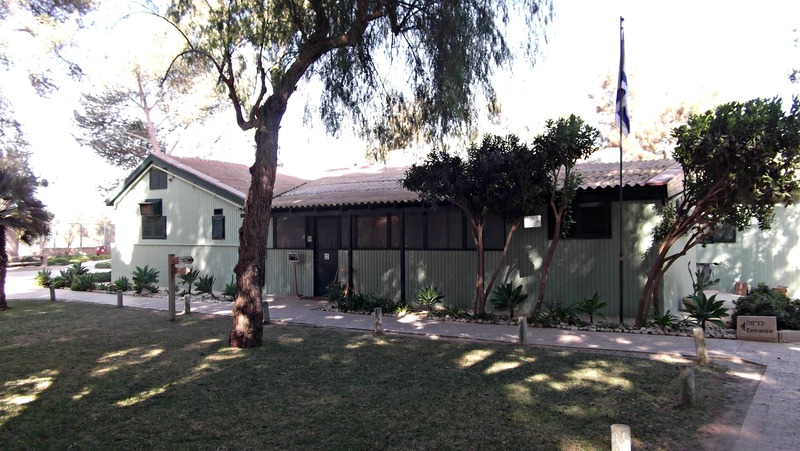 I parked outside the kibbutz and walked over to the historical site, Ben Gurion’s little house. 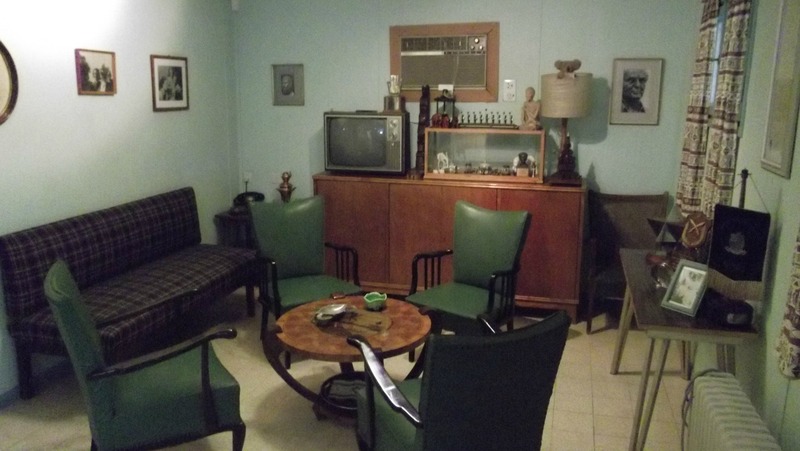 Within the property, belonging to the kibbutz, I found a winery store and then various huts leading up to the front office. In two of these huts I found screens, and attempted to watch the animated film depicting David Ben Gurion’s life but, alas! the computer shut down mid-screening and so I temporarily abandoned the video presentations. Composed of superb animation, which reminded me of the “The Adventures of Tintin” TV show, and a richly accented English voice, I really enjoyed the video (screenshot above). 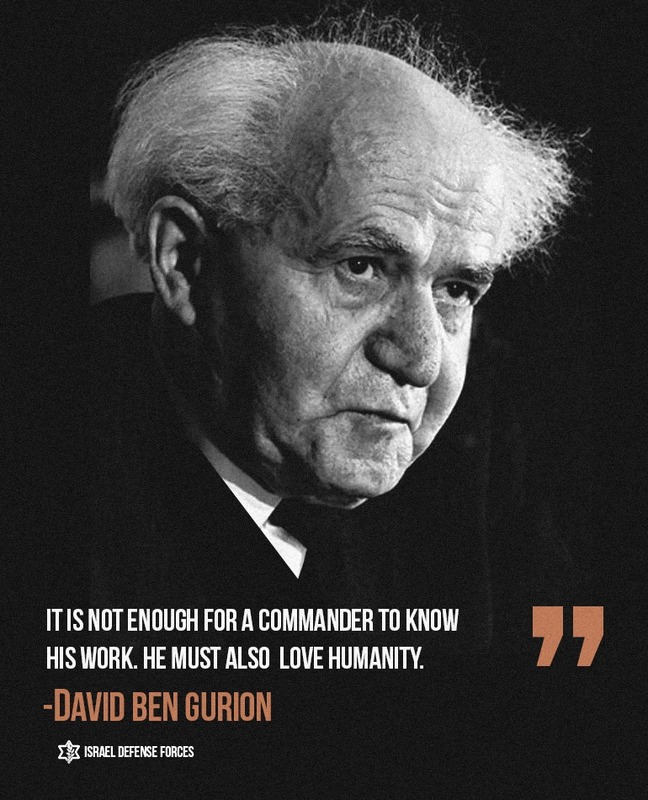 A brief synopsis on a pretty influential life, David Ben Gurion (originally David Grün) – often referred to as the “founding father of Israel” – was born in Poland (Czarist Russia) in 1886 and immigrated to the Holy Land in 1906 where he began working on settlements. 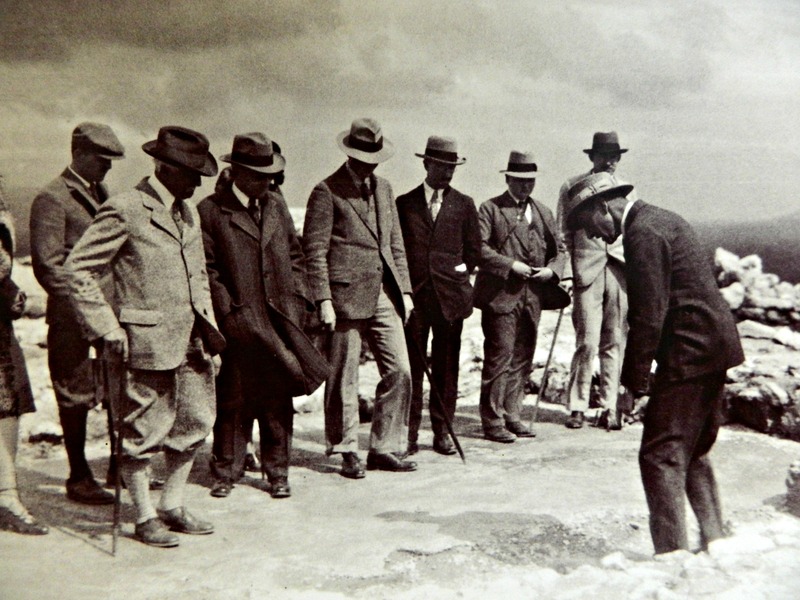 By 1915 Ben Gurion was expelled by the reigning Ottoman Empire and made his way to the United States, there further aligning himself with Zionism. 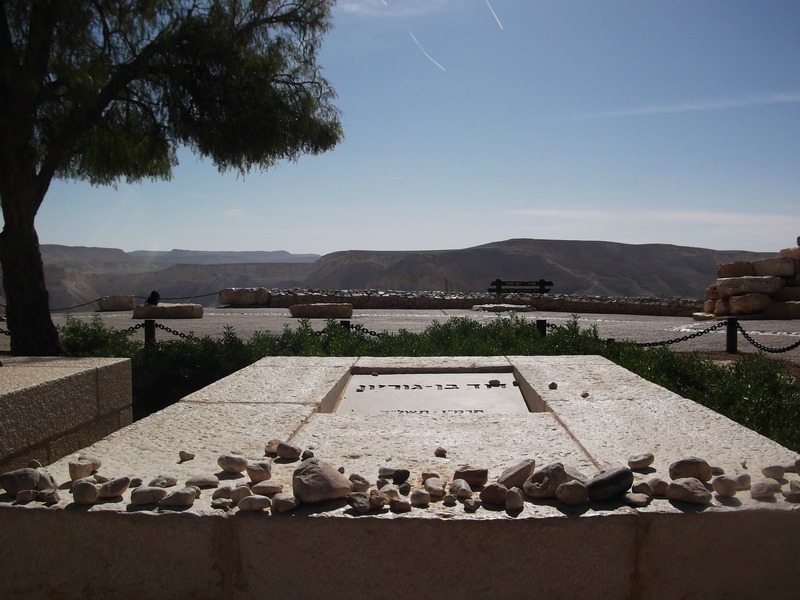 In 1918 he enlisted in the British Army’s Jewish Legion and returned to the Holy Land. In 1935 he was elected Chairman of the Jewish Agency and on May 14, 1948 announced the establishment of the State of Israel. 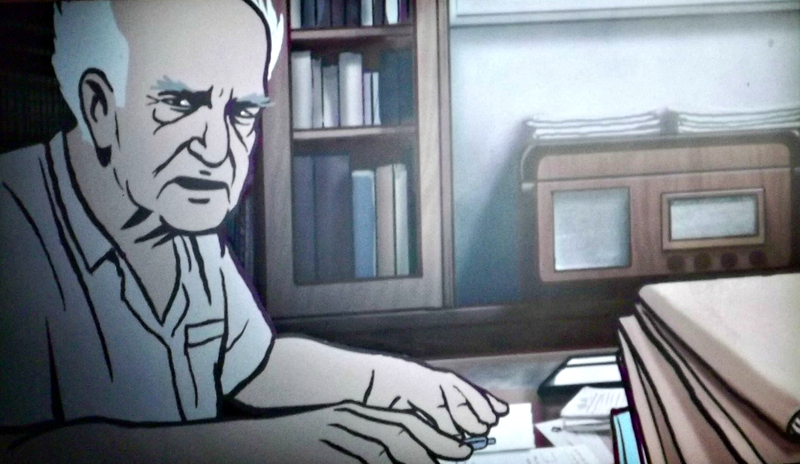 Becoming the fledgling country’s first Prime Minister, Ben Gurion switched between politics and living quietly on Kibbutz Sde Boker, in the above house. I entered the little green wooden house – left exactly as it was back then – and looked around, starting with the living room. An informational plaque on the wall explained the identity, and sometimes origin, of the various items and knick-knacks placed throughout the little room. I felt like I was in an Israeli version of Greenfield Village. I stood and photographed for a while and then began to look around. I noticed that an army unit was getting an official tour and asked them which unit they were. The answer: “Oketz“, the IDF elite canine unit. Cool. Next. two IAF fighter jets did a screaming flyby, passing not too far over our heads and definitely capturing our attention. On their return trip, heading back to the wilderness, I tried capturing them on camera but it came out blurred.